Would a ride alongside Kimi would be to much to ask? Well, if he does read tabloids, maybe he does read forums too. Do we have a "gorilla" as a member? He could have an other name. Any ideas out of "gorilla"? Thus continuing, Kimi will stay at Ferrari even in 2016. I know that even Marchionne has jumped on the chair, seeing the first lap 'made in China'. The Holy Drinker, as seen on the slopes of Melbourne, Sepang and Shanghai, is very determined. Also very fast, at least in the race (in qualifying, honestly, a little 'less). And it is a shame that you can not know the full extent of dialogues via radio competitions in progress: I assure you that are not only fun but also very instructive. Raikkonen wants to stay and you realize that, given the events of 2014, the results are the best ... deposit. If he can still talk to the stopwatches, get what you want: close career in the team that wanted to win back very strongly, creating what in modern times had been accomplished only by Clay Regazzoni and Gerardone Berger. It would do a favor to Maurizio Arrivabene, who would have more time to think about the medium-term prospects, notwithstanding the undeniable presence of Seb Vettel. Ok, everything is in the hands (and feet) of the last world champion with the Red. Don't know, but when Turrini tells about radio dialogues, I guess he means something his friend Antonini has told him. I wouldn't be surprised. Kimi Raikkonen says the current Ferrari team environment is the best he has experienced in Formula 1. Raikkonen is in his second stint with Ferrari, which he joined from McLaren in 2007 for an initial three-year stint, before returning in 2014 after spells in the World Rally Championship and back in F1 with Lotus. 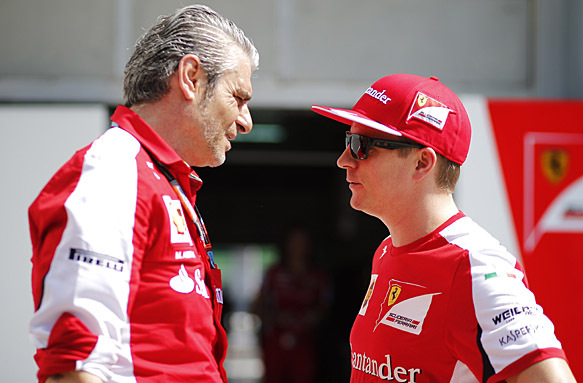 Ferrari has recently undergone a major restructuring headlined by the arrival of Maurizio Arrivabene, a change that Raikkonen feels is working extremely well. "I must say, in the past when I was here at Ferrari they were good times and it was a good atmosphere," he said. "But this year is the best that I have had in any team; how the team works together, how people work together, how the atmosphere is and how things are being run. "That tells you a lot. I'm very happy." Raikkonen indicated last summer that he would probably retire from F1 after his current contract expires at the end of this year. Asked if his improved form this year and his happiness with the current Ferrari regime might make him stay longer, Raikkonen said that choice was not up to him. "The team has to decide that," he said. "You will have to talk to them. "Time will tell what will happen. I'm happy with how things are running." Raikkonen's team-mate Sebastian Vettel reckons the Finn would have plenty of alternatives if he wanted to change teams. "I think he's doing a very, very good job," said Vettel of Raikkonen. "He was in the past. Probably last year it wasn't noticed so much, but inside the team it definitely was. "I don't know the details of his contract. I think it's in his hands if he wants to carry on in Formula 1. "There would be plenty of interest in a fast driver like him, with the experience that he has, if he wants to carry on in Formula 1. "If he doesn't want to then he will quit." Q: Kimi, Ferrari has changed significantly since 2014. What is the biggest change? Kimi Raikkonen: I think the team is working well together now. Some people have left and there is a new team boss and now the atmosphere and the way people are working together is much better. Q: Ferrari’s performance is clearly running north, but at the moment you seem to be mainly fighting for P3 in races. When will that change? KR: I expect us to get stronger in the course of the season. Yes, we are not happy about where we are right now as we want to challenge for wins, but we have to be realistic when looking of where we finished last year. We have made a good step forward and now as a team are we have to work in the same direction - then I am sure that we get where we want to be. Hopefully in the near future? KR: That is up to the team to decide. They have an option on my services - so go and ask them! Q: But you also have to like it, don’t you? KR: (laughs) I wouldn’t be here if I didn’t like it! KR: Things can change! I want to do well here. That is the main reason why I am still around. Q: In Malaysia Ferrari caught Mercedes out with a smarter strategy. Will that prove to be your main weapon against them or can you close the gap? KR: A smart strategy can help, of course. You can gain or lose positions depending on your strategy - but it is not our aim to do it that way. We want to improve our situation as a whole: improve our speed to challenge Mercedes in every single race. Right now we are pretty close to them in the race - not in qualifying, but in the race. We know now where we have to improve and we are working on that. Q: Sebastian (Vettel) as team mate: how is that? KR: No different to any other team mate! Q: The two of you together in the same team - that sounded like a match made in heaven. Is that how it is in reality? KR: I think we are a good pair - leave heaven out of it! (laughs) We can talk things over, and that is a lot. We both want to put the team in a position to improve. Q: Is your situation, working together in the same team, helping you to bond more privately? KR: Not really, no more than before. We just work in the same team - and it is easy together. We talk easily together. Q: Does it help that neither of you is overly political? KR: I would say so, yes. The good thing is that if there is something (that comes up) we can talk to each other - we can talk to each other directly and not have to use mediators. But we don’t have any issues and I don’t expect us to have issues. But who can look into the future? Who knows? Q: Sebastian has had the edge in terms of results so far. Why is he doing better than you? KR: He has done better races. We had some issues in the first three races and obviously made some mistakes in qualifying, but that is part of the game, so no big deal. Q: 2014 was a tricky year for you - does it feel much better now or are you beyond such emotions? KR: The feeling in the team is much better, but the results are still not what we want. Yes, compared to last year finishing third or fourth is a step forward, but we want to win - win all the time. As a team we’ve done well so far, true. (We’ve got) the maximum that we could right now. But are we happy or satisfied? Not really. We want more. We are here to win - and yes - that is still pretty emotional. KR: …that is not completely true. If you had a good fight and pulled the maximum out, you are happy. First and foremost you have to be realistic. We have come a long way from last year - and yes, there are still many steps to make. Q: If you could make one wish, what would that be? Q: Niki Lauda said to succeed in F1 racing you ‘have to be a b*st*rd’. Were you one, the year you won the championship? Q: Bahrain, with its warm temperatures, is a much better climate for Ferrari. Could that help? KR: We are racing in the evening so the temperatures are lower, so no help in that respect. I think that we will race at the level where we realistically are. Q: You have a little baby boy. What values do you want to give him for his journey through life? KR: Life - that is a long time. Right now I hope that he is healthy and stays healthy - and that he grows into a happy little boy. Q: How would you rate yourself as a dad? KR: I don’t know. You’d have to ask his mum. But he is a calm baby - so we are doing something right! ps: great to see you around! Kimi Raikkonen’s manager says everything is moving in the right direction for the Finn to extend his Ferrari contract beyond this year. Raikkonen, who last year hinted that 2015 might be his last season in Formula 1, is now committed to a longer term future with the team, and just has to wait for the Maranello outfit to take up its option. Lewis Hamilton has been linked with Raikkonen’s Ferrari seat, but the Briton’s Mercerdes team has ruled out a move. “Everybody’s positive,” his manager Steve Robertson told Motorsport.com. “Kimi wants to carry on and he’s made that very, very clear. “The team is happy with his input and his consistency. It’s all positive talk, but there’s a difference between positive talk and pen to paper and all that sort of stuff. Raikkonen has been upbeat since his first run in the SF15-T hinted at the potential of the package, and he works well with friend Sebastian Vettel. Robertson agrees that the key is Raikkonen is having fun again. “As soon as he had the first test he said, ‘The car’s a good car, there’s a lot more potential there, they took a big step in the chassis and a big step in the engine. “He’s enjoying driving. At the end of the day for Kimi it’s very important that he enjoys it, he doesn’t need to be here for any other reason. “He wants to be competitive, he wants to be challenging for races wins and championships, and now he’s in the position to do that. “It’s a completely different team, it’s a completely different package. Everything is positive. Last year it was difficult to find something positive. He enjoys the car, it suits his driving style more, he’s in a team that’s on the upward trend. Everybody is pushing. “Just look around at all the smiling faces, and Kimi’s one of those smiling faces.